This Knitter is Nerdy…. – That's StitchTastic! At the beginning of the month, I registered for the CYC CIP Correspondence course. I have been working whenever I can on my swatches, and now have them all done and blocking. Yay! Now all I have to do is finish the written requirements of my course, package it all together, and mail it to my instructor. I am a little giddy with anticipation, wondering how my work really holds up when being critiqued by someone with more expertise. 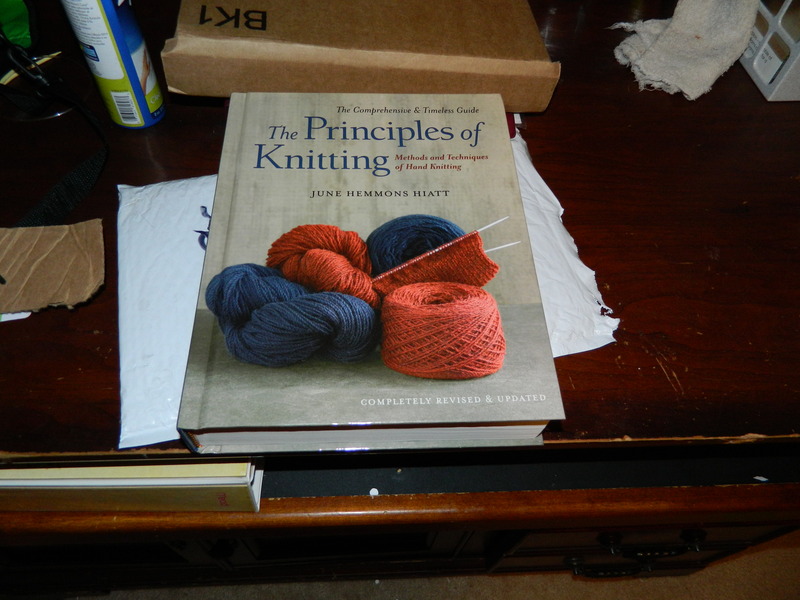 But knowing that my next step is to enroll in the Knitting Guild Masters Courses, I started researching what books and references I will need. One book that was recommended strongly was The Principles of Knitting (Affiliate Link) by June Hemmons Hiatt. So at my next opportunity, I ordered it off of Amazon. I am a little ashamed to say that in all the years I have been knitting, I have never heard of this book. It is apparently a classic, and first editions were going for hundreds of $$ on Ebay! So when my hubby handed me the package when it arrived I have to admit I wasn’t sure what to expect, but knew it must be good! Yes, this is really my messy desk. I’m not perfect, and this is proof. But each page is valuable, and doesn’t contain any fluff. The information is straight-forward, thorough, and digs into the knitty-gritty. While most books just give you the patterns, and the picture of the finished project… this book gives you the technical knowhow to make the envisioned work a reality. I think it is safe to say that this book will never win a work of art award, however, it is full of beautiful pictures and illustrations to help ensure the information is comprehended and understood. The book itself may be presented at a reference to refer to when needed, I think this is a timeless treasure that should be in every knitter’s library. Even beginning knitters can benefit from this work. Quick, go put it in your Amazon cart before it goes out of print!! I admit, this does not look like a book to cozy up to on the couch with, sipping a cup of coffee. But I have been reading through several chapters and am quite enjoying it. I have spent several afternoons of quiet time with this book, and look forward to many more. But that is just the nerdy part of me. I know I am not the only crafty one with a nerdy side. So what are you reading for learning fun? That book looks fascinating – I hadn’t heard of it either. But I’ve grabbed the Kindle sample, so I can remedy that if necessary! I was just thinking that I’m not really reading anything nerdy, just a book about the history of quantum physics… oh wait. Good luck with your CIP course – sounds awesome! I think my hubby would enjoy what you are reading. I don’t even understand basic physics..
Great review on the book. I’ll put it on my wish list. I’ve heard of the book before, but have never been tempted to go buy it. You’ve made me think twice about that! I hope everything with your course and swatches turns out well. It sounds a bit intimidating to me. WOW! That volume is ENORMOUS! It’s nice to hear that it’s well done! I think I could use a solid reference of my own! I’ll have to try this out. 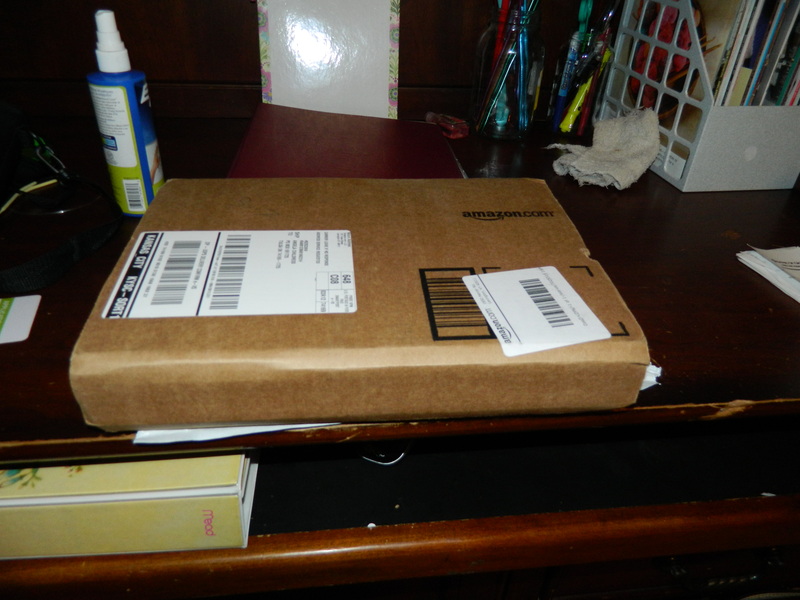 Mine has arrived too – If I am honest I am little afraid of it!!!! You shouldn’t be afraid of it. I’ve actually found a lot of use for mine, and no not as a door stop or a paper weight, haha. The next stitch I need to learn is the Brioche Stitch and I have found a lot of helpful info in here! I’m a beginner and am so surprised to learn about a Masters level in knitting!! Well, I knew there were some who were way more advanced, but hadn’t ever heard that term before. Cool!! Read and knit on!! Hi Paula! Welcome! I’m happy to hear from another beginner. 🙂 I checked out your blog, and it looks great! Have a relaxing weekend!